Users may notice “Run-Time error – 2147024843 (80070035)” when attempting to launch Acctivate after changing the name of the Server. 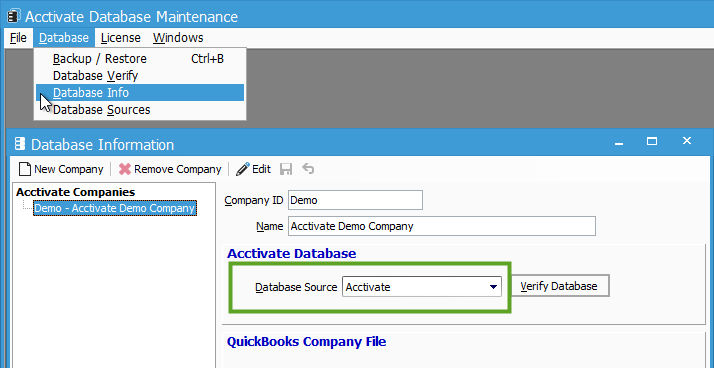 This is caused by references to the old Server Name in Acctivate configuration and licensing, as well as the instance of SQL Server which Acctivate is using. This article will explain the steps to get Acctivate working again after changing the name of the Server where Acctivate is installed. First, open the Database Maintenance application (by default, located in C:\Program Files (x86)\Acctivate on the Server). Then click Database > Database Info. Click on your company file in the Acctivate Companies list and note the Database Source used. Next, while still in Database Maintenance, click Database > Database Sources. Click on the Source which is used by your Company file and verify that the Server Name is using the new name of your Server. 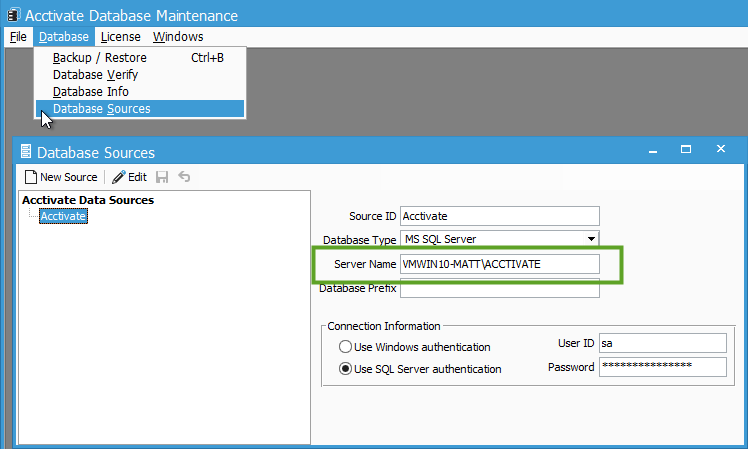 In the example of the screenshot below, the name of the Server computer is VMWIN10-MATT which makes the name of the SQL Source VMWIN10-MATT\ACCTIVATE. If the name of the Server is changed to something like “NewServer” you would need to click Edit and change the data in the Server Name field to “NewServer\ACCTIVATE” then click Save to save the changes. Once this is finished, you will likely need to re-register Acctivate on the server as your Acctivate license will still be referencing your previous Server Name. SQL should reset to use the new Server Name. If not, Microsoft created this article to explain how to reset the metadata in your instance of SQL Server. This work should be done by whoever manages IT for your company. If you have any issues, please contact Acctivate Support.